About 5 minutes ago Kien stood up, took a drink from his sippy cup and walked 3 steps, and then sat down again like nothing has happened. Jef and I both watched it, and were so surprised! He has been practicing his standing, but not walking independently. I guess these next few days we will see him progress his walking. I've been reading about 'baby lead weaning' so have decided to let Kien feed himself as much as possible. Meal times are so much fun. I prepare meals that we can all eat, then Jef and I sit with Kien, next to his highchair, and we eat together. Meal times have all of a sudden got extremely messy! Here is last night's carnage. On Friday 7th evening Jef was outside on the lawn with Kien at Amy's place. He stood up independently from squat, and as standing for a few seconds. Then on Sunday 9th January Kien took his first step without hanging on to anything. He did this first on the couch, then from holding onto the chair transitioning to the walker. Since then he has continued to build his confidence, and he has often stood and let go of what he was holding on to for support. He has done this a lot in the bath - which is quite scary because it is slippery in there! Speaking of baths Kien went through a stage of about a week around Xmas/NY period where he did not want to get into the bath and would screech and cling on to me tightly at the sight of the bath. It was so sad to see him petrified of the bath because he loved it so much and would spend so much time in there. I had to slowly coax him back into the bath by getting in with him and having him sit on my knees playing with his toys until he dropped them and wanted to get down to pick them up. Once he was in the water everything is back to normal again...go figure :-) So now we no longer bath him in the little plastic baby bath because of this episode. 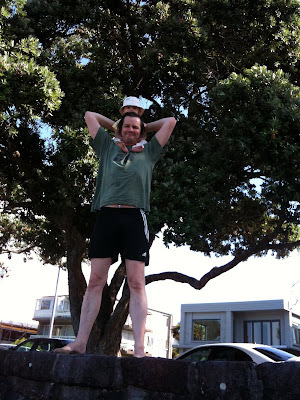 We went to the beach on Saturday afternoon - the sunshine was glorious. And on 13th January I stopped filling out my spreadsheet. That is a milestone! 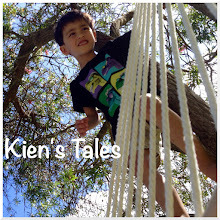 What a difference - in such a short space of time it feels like Kien's development has been exponential. He has become really good at holding his milk bottle, and even in the middle of the night I can feel his hands and little fingers grasping the bottle. It really does make giving milk that much easier! When we go in the buggy and he is hungry I just have to recline the seat and give him his bottle. He still is able to enjoy the view and gets his milk, and he tends to drink much better when he is distracted too! Yesterday we went to Okahu Bay playground and Kien went down a slide all by himself, for the first time ever. Usually we have to help him so he doesn't hit the back of his head, and lately I've just been holding his hands so he can remain steady upright while he slides down. So it is great that he can now do it all on his own, and as you can see he also likes to climb up the slide too. He has been getting on and off the couch for the last month or so now after I taught him how to get off the coffee table feet first. He now thinks he can get off anything just by pushing himself backwards and dangling his feet expecting to touch the ground. I'm glad he has good sense not to just push himself off things hoping to be close to the ground - although he is now so confident on the couches he tries going off the arms, which are a lot higher off the ground more painful when he falls! At the moment we are going through an easy patch with Kien - long may it last. No more teething troubles, no more vomiting (this stopped about 3 weeks back), no more having to blend his food up now that he can handle bigger chunks, and no more patting to sleep on the odd occasion. I just now plonk him into his cot and sit there surfing the internet and he generally falls asleep without too much fuss. If he can't settle I do end up leaving him to fall asleep by himself, and sometimes he will crying for about 30-60 seconds after I leave the room, but most of the time he just falls asleep. These are definitely the good times! A couple of days ago we ventured to Ambury Regional Park. It was so much fun! We patted cows and chickens, and I tried to pat a turkey but it was way too feisty for my liking. If Kien stood at the fence I am sure he would have been pecked so we steered him clear. In the pig pen we found them eating and making lots of noise and mess (of course, they are pigs after all). There were two, and the little one kept ducking around the big one trying to get into the food. They had a very balanced and nutritional meal full of fruit and vegetables. 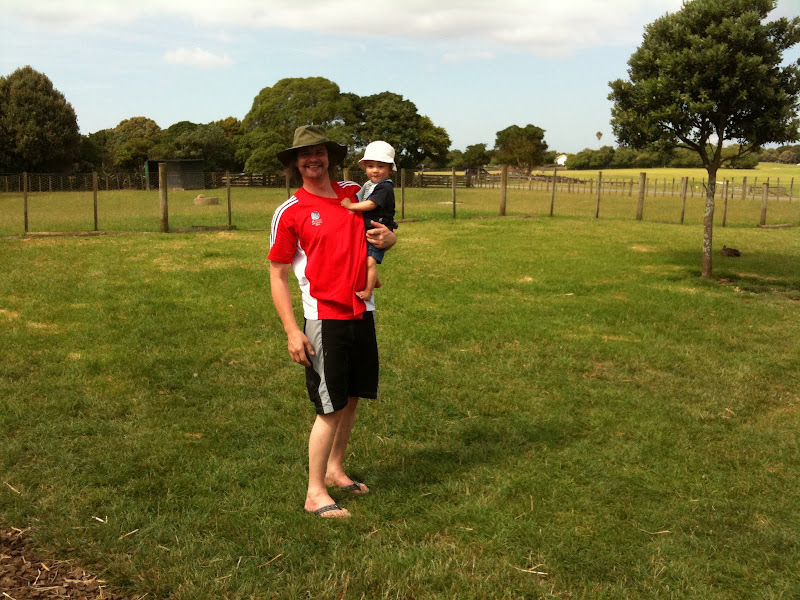 Here are some pictures from the trip to Dargaville on new years day at the farm. Wonder if the dog wants to be ridden on? Wow, it's been a pretty eventful week indeed. I've been feeling a little overwhelmed with so much going on (although I didn't actually think I was until I pondered on it a little), and have been a bit lethargic and grumpy. Oh Kien, when will you ever actually sleep through the night to give your parents a break?!? I made some scones with strawberry jam and cream in the morning, and took them to Dad's for a christmas bbq lunch. Co Le, Chu Lu and Ti was there, as well as Mimi, Vincent and Vivian. We ate yummy eye fillet steak, grilled prawns, and lamb cutlets. I made sure not to overeat so that I didn't feel rotten - I'm glad I listened to myself. We tried putting Kien down for a nap in the stroller in the afternoon but he was just too perky and awake. We decided to head over to Mum and Rod's, and hoped he would fall asleep on the way - which he did. So we went for a little drive to the Drury off-ramp so he would get at least half an hour to sleep. He woke up after half an hour anyway, typical! 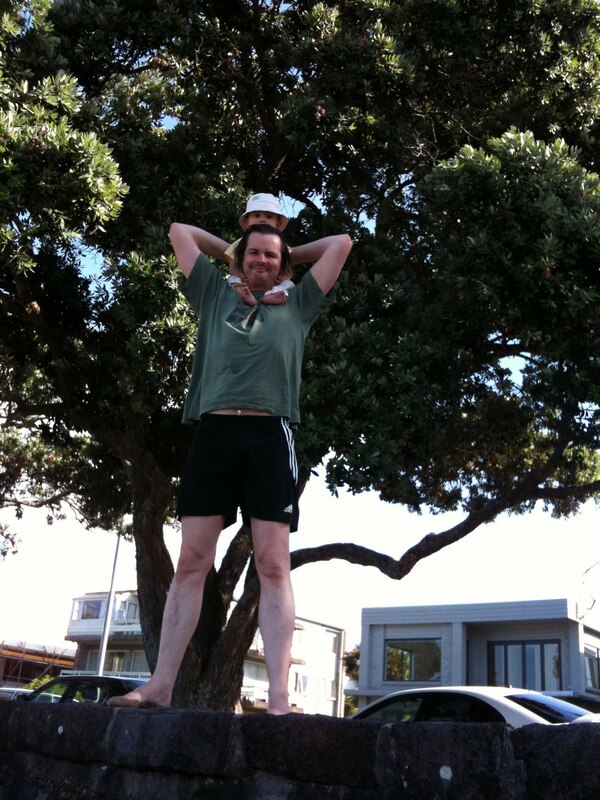 Xmas afternoon was fun at Mum and Rod's. Kien enjoyed grabbing at Sasha while she barked at him insistently. That dog can sure yap! She is cute though. 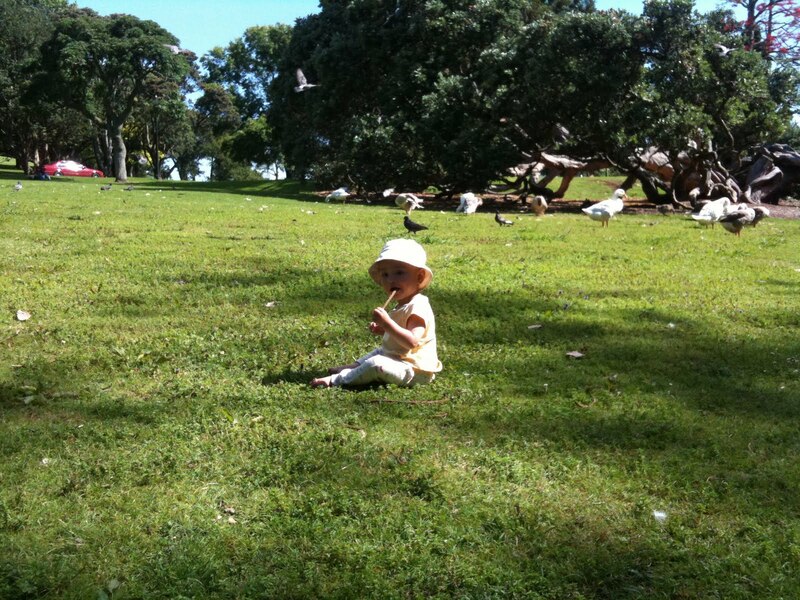 On Wednesday we had Kien's birthday at Western Park. I was so grateful for Mum, Rod and Chris showing up early and helping out with the setup. Everything was laid back and easy going until 1pm when we had to get everything down to the park in an hour. I went out to Dad's at 11am after putting Kien down for a nap. Dad had made some spring rolls and chicken wings, Co Le had made some Vietnamese jelly, and I also had to get the folding table. So I did the trip in under an hour, and still managed to have a quick bite to eat at the shop. We had a good turnout of friends and family with lots of presents for Kien. He really is such a lucky little boy. Linda made him this lovely birthday cake. All the children gathered around to help Kien blow out the candle after we sang to him. On new years day we drove up to Dargaville to the farm to have lunch with some of the Cole clan. Jef has lots of fond memories of his childhood spent on that farm (although the old farmhouse has now been sold). Kien got to pat some chickens, cats, and a dog that he tried climbing on. He likes animals, especially dogs. We stopped by the beach on our way home. 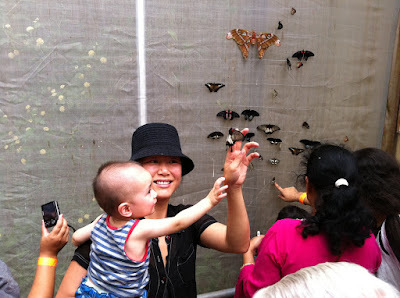 We definitely need to do more trips away from home now that Kien is older and more aware of his surroundings. Wow, we made it a year already - it has been hard but so worth the effort. We love our little boy so much! Can't wait to take him out on the yacht. I can't wait to actually get on the yacht for the first time. I paddled out there on the kayak on 30th Dec and had a look up close. I didn't get on it though - I wanted to but the sea was rough and the wind was blowing quite heavily. Something else to look forward to, yay!